Finding out or suspecting that you have a leak in your home or business is probably the last headache you need at the moment right? What can seem like a minor problem can quickly spiral out of control and become an expensive exercise in being a home or business owner. Hoping the problem is going to just disappear is the first step that people take but this obviously isn’t a solution. 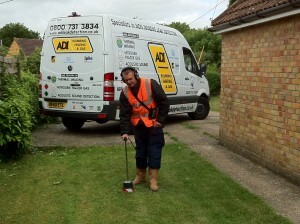 That’s where a leak detection specialist company like ADI come into the picture. ADI engineers are already qualified plumbers but their leak detection skills go a step beyond what you’d expect from normal any regular plumbing company. This is due to the fact that ADI engineers use the type of equipment that’s nothing short of amazing when it comes down to it. So what central heating leak detection offers you is the ability to find the exact source of a gas leak without having to take up your floorboards, drill holes in your walls or dig holes all over your well tended lawn. 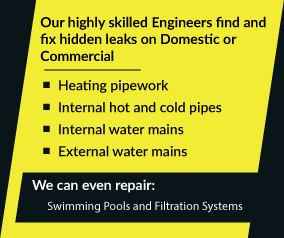 In fact our techniques are so refined that we can find the source of most leaks within 50mm of the damaged pipe work or in other words within 5cm of the source of your problem. So because we don’t need to dig or drill random holes we can offer you a totally non-invasive leak detection survey on your domestic, commercial or industrial property. All the usual noise and fuss you’ve probably come to expect from tradesmen is something that just doesn’t happen with ADI and as a matter of fact you’ll probably forget we’re even working on your property half the time. The benefits of leak detection versus dealing with an antiquated plumbing company are that we can find the source of your leak in the most precise way possible and without causing any damage to your property in the process. It’s the ADI way!